This guide will help you get started with Meteor APM, to better understand how your app behaves and identify areas for improvement. Run meteor add mdg:meteor-apm-agent inside your Meteor project. Once you have deployed your app, enable “Galaxy Professional” from the app settings page. In the Performance area on the App Overview & Containers pages. In the Galaxy Professional area on the App Settings page. After a minute, data should begin appearing. This is the overview of the Meteor APM Dashboard. The dashboard is meant to be self-explanatory, but if you’d like more information, watch our Onboarding video. While there is no right or wrong way to use Meteor APM, here are some common use cases. 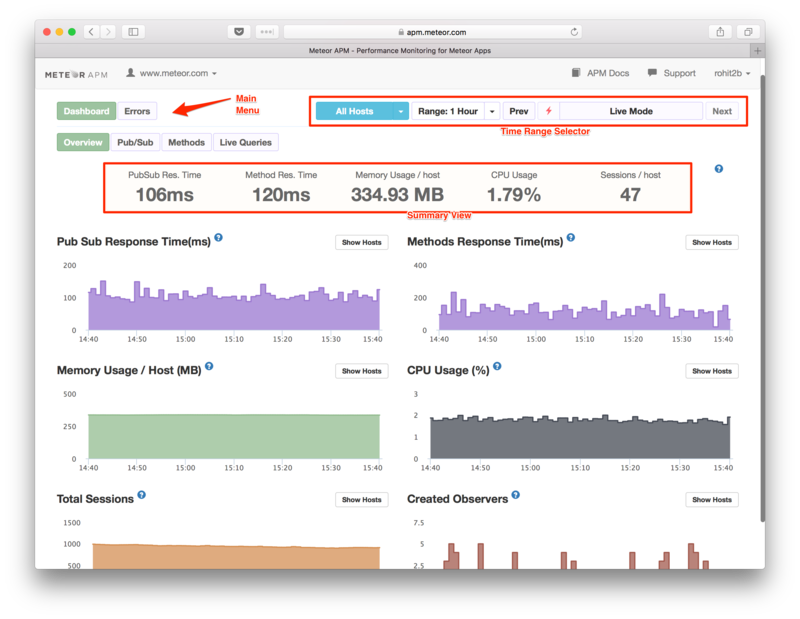 Normally, for a typical Meteor application, the Average Response Time of a Meteor Method should not be more than 200ms. If it exceeds this, you may be able to improve performance. First click on Methods on the Main Menu and look at the Response Time. Also look at the Response Time graph for any spikes. If you find places where the Response Time is higher than 200ms, click the Detailed View button on the Sub Menu. Then find the Response Time and click on the spike in the graph. This will show a set of traced methods at that time. Click on a trace to see exactly what has happened on that method at that time. Follow this article to understand the traced data and improve your method accordingly. You can follow the same process for PubSub. Click on the Detailed View of Methods. Sort the Methods Breakdown by Throughput (the default sort criteria). Click on a method name in the Methods Breakdown. Assess the impact if you improve the selected method. Click on the Response Time Graph and find a trace. Try to make your app faster and improve your method if possible. Do the same for all methods. You can follow the same process for PubSub, but you will need to sort the Pub/Sub Breakdown by SubRate instead of Throughput.